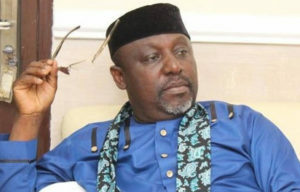 Imo state governor, Rochas Okorocha, has said to the National Chairman of his party, the All Progressives Congress, APC, Adams Oshiomole, that him (Okorocha) would not speak like a tout. Okorocha through his Chief Press Secretary, Sam Onwuemeodo, yesterday in Owerri, responded to a statement credited to Oshiomole, that Okorocha, was behaving like a drug addict. This is to say, a second round of the media war between Okorocha and Oshiomole. The duo have been in a running battle, since Oshiomole, publicly recognized Senator Hope Uzodimma, as the governorship flag-bearer of APC, in the state. A move which has threatened Okorochaâ€™s plan for Uche Nwosu, to be his successor. While in replying Oshiomole, Okorocha described the Catholic Bishop of Owerri, Archbishop Anthony Obinna, as his spiritual father, denying that he was not in enemity with the Bishop. He went further to say that Oshiomoleâ€™s display since his reported announcement of Senator Uzodimma, as guber candidate would destroy the party. â€œGovernor Rochas Okorocha must have committed against them. The APC National Chairman did not mention the sins that warranted the apology. He kept his audience guessing. The givernor challenged Oshiomole that, â€œIf he had asked question, he would have discovered that members of the Catholic Church in the State Constitute the bulk of Governor Okorochaâ€™s supporters especially at the grassroots. The release expressed that, â€œThe governor holds him in a very high esteem and has no personal problem with that outstanding man of God. But the truth is that the Archbishop perhaps expects the perfect Leadership expected in heaven to be established in Imo which is not possible. It boosted that, â€œThe Archbishop is the spiritual father of the governor. And the governor has never let him down. â€œAnd Comrade Oshiomhole should find out from President Buhari whether Governor Okorocha took him to the Archbishop in 2015 when he came on Campaign for a private meeting that lasted more than an hour. â€œTo us, that was a high demonstration of respect and regard. But guess what? Two days after, the newspaper owned by the Archbishop came up with a banner headline â€œAlhaji in Government Houseâ€ and part of the story was that the governor was taking young Igbos to the North to be Islamized. â€œAll these were part of the Campaigns to discourage Imo people from voting for him, APC and President Buhari. These are the issues. â€œSo, Comrade Oshiomholeâ€™s apology was a badly tailored blackmail. And somewhat inciting. He is only trying to justify the blunder he contracted and dispatched Ahmed Gulak to commit in Owerri. â€œWe want to remind Comrade Oshiomhole that he is the National Chairman of a ruling party. His actions and utterances should reflect the dignity such office carries. â€œFor instance, when Governor Okorocha spoke to the media after meeting with Mr. President, one could see maturity in his speech. He didnâ€™t start calling Oshiomhole names because calling names is meant for touts. â€œAs a matter of fact the National Chairman didnâ€™t treat the concerned governors well no matter his reasons. He should not expect them to go home celebrating.